They said it couldn’t be done. They said it was impossible. They said, well, they said lots of things I can’t repeat. But the one thing they didn’t say was, “She’ll never give up because she’s as stubborn as an Appalachian mule.” So today, Leslie proved them all right and wrong and bagged her first chukar. 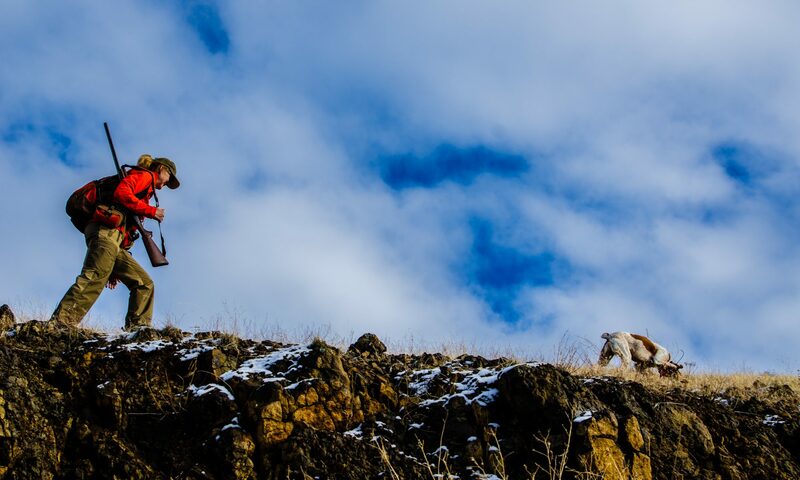 Two months into her first season, at age 55 and never having shot a gun until August, any chukar hunter will tell you this is an accomplishment-and-a-half. Both dogs were birdy, and Leslie was above me. Peat flushed four chukar just in front of Leslie, who – because she has learned to decipher the degrees of birdiness in our dogs – was expectant. I saw the birds go at the same time I heard the shot, but didn’t see it fall. It took Leslie a few moments to say to me, “I think I got one.” It was almost as if she couldn’t believe it. Then Angus made a beeline down the slope and lifted his head with a mouthful of feathers. Initially he headed to me, but Leslie called him and he changed course and brought it right to her hand. What made me feel even better than the pride I felt for Leslie was seeing her smile, like a curse had been lifted. She looked at the bird, which she’d killed instantly with her 20-gauge, 1 oz., 7-1/2 shot load, and thanked it for its life, something I’ve gotten away from doing, regrettably. We continued on for another 2 hours or so, and she got off a couple more shots but didn’t connect. I managed a Hun and a Dusky grouse, so a three-species day in mid-November on a year that was supposed to be meager from last winter’s massive snowfall ain’t bad. Yesterday was a good day, too, in another spot where we saw lots and lots of chukar and bagged a couple. So there you have it! Congrats Leslie on your first chukar and meeting your personal challenge. Quite a journey you’ve taken this year. Thanks for sharing it with us all. Super!! The shot heard around the world! (At least the next canyon over). Nicely done Leslie. Congratulations Leslie. In fact congratulations to all four of you on some great outings. Congratulations! Great Accomplishment. You know that a chukar for your first bird is something most hunters take many seasons to work up to. You remind me of my wife who took her first fish on a fly and it was a Permit (equivalent to a chukar in the fly fishing world). I am so in awe of the women who give it a try. So happy for the both of you and a memory that will never be forgotten. I include you Bob because as you know, it is challenging to get a inexperienced gunner into the position to even have a remote chance. I know Leslie has hiked many miles recording hunts, but it’s just different trying to put one in the bag. I guess i’m a little long winded because my son and I just returned from a trip where we spent many days and thousands of feet, missed shots and young dog work that could not be rewarded with shots trying to get his first one. The look on his face was one of accomplishment with a touch of sweet revenge when it happened. Keep the good stuff coming. Would have been an accomplishment had it been a sharptail. But, a wild chukar is a fairly small club Leslie has joined. Congrats! Congrats Leslie! You will never forget your first! I know I still remember mine. I must say I laughed out loud when watching the video of her shooting as she fell down. That is the epitome of chukar hunting! Congratulations, Leslie! I’m impressed that you have taken up hunting and stuck to it through the beginner’s drought to finally bag your first bird. Brava! Keep it up Leslie! And share more of your experiences afield.